Los Angeles duo Jetdog released their sophomore effort Smoke, Perfume and Candy at the beginning of May, a little less than a year after their debut Outer Space is the Place. While that particular record had a heavy, fuzzed out sound that channeled a considerable amount of psychedelic and stoner rock influences, Jetdog has gone in a slightly different direction this time around. The haziness and fuzzed out guitars remain, but the majority of Smoke, Perfume and Candy goes for a softer shoegaze aesthetic and slower arrangements that stretch things out to their farthest point to create a droning, hypnotic effect. It does run into a few issues over the course of the forty minute run-time, but for anyone that likes shoegaze and droning rock it’s worth giving a listen. The biggest difference between Jetdog’s sophomore effort and their debut is a noticeable tonality shift. Although Smoke, Perfume and Candy still incorporates one fuzzed out guitar riff after the next, it’s not quite as dense and bottom heavy as before. Instead, the fuzziness is a bit lighter and comes off feeling closer to the expansive haziness of shoegaze as Dominic Massaro’s guitar arrangements completely fill the sound out. The focus of each song appears to be based on taking a single riff and stretching it out into a droning, feedback heavy soundscape that completely pulls the listener under its spell with a combination of melody and a slightly rawer edge. For the most part, Jetdog pulls this off perfectly and the increased emphasis on melody feels like a natural attempt to branch out from their debut. However, my main complaint is that this time around the programmed drums are a bit too prominent in the mix and follow an extremely similar pattern from one track to the next. This is most noticeable when the layers are a bit sparser, and it doesn’t happen on every song, as “Lost Inside” seems to find that perfect balance between the different elements. But I did find that there were a few too many tracks where the drum programming was prominent enough to distract me from everything else that was happening, which did prove to be an issue over extended listens. Dominic Massaro and Nina Spiezio both contribute vocals throughout Smoke, Perfume and Candy, and their overall style is a softer one that emphasizes repeated words and a singular pitch that blends in with the droning instrumentation. It’s the type of performance that is likely to appeal to a particular type of listener, but chances are if the mention of anything shoegaze or drone struck your interest then you’ll be able to appreciate it. What stood out to me in particular is that Dominic and Nina often sing at the same time rather than trading off, creating a singular voice at times that hovers over the instrumentation with an airier feel. 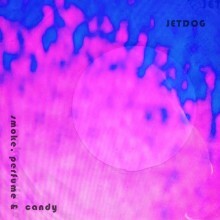 But even though there’s this repetitive, melancholic emphasis to the vocal performance the lyrics often seem to have a bit of humor to them for those that want to explore beyond the hazy layers, which I do think could help to further set Jetdog apart from some of the other groups of this type. For their second album Jetdog has lighted things up a bit while still incorporating the psychedelic elements they offered previously, making this a natural progression for the band. While the drum programming did sometimes overwhelm the rest of the instrumentation and take my focus away from the other ideas the duo had on display, it isn’t a deal breaker and this is still an album worth diving into if you want to lose yourself in some hazy, sprawling shoegaze/psychedelic rock. Considering how quick the turnaround has been between albums, I expect it won’t be long before we hear more from this group and it will be interesting to see where they choose to go next.